Like its larger sibling, the Microsoft Surface Book 2 (13.5-inch) is an excellent device, and one of the most powerful 2-in-1 devices we've tested. It has a premium design, excellent features and is a great showcase for Windows 10 - though it comes at a price. Microsoft’s range of Surface devices have shown in the past that the software giant has mastered creating premium and desirable devices that can give Apple, Lenovo and other big name brands a run for their money. And now it looks like it’s done it once again with the Surface Book 2 13.5-inch, an incredibly powerful and versatile 2-in-1 laptop. Along with the larger Surface Book 2 15-inch, which we’ve reviewed separately, these devices represent the pinnacle of 2-in-1 laptop design, offering power – and battery life – that we’ve not seen before in a convertible form factor. 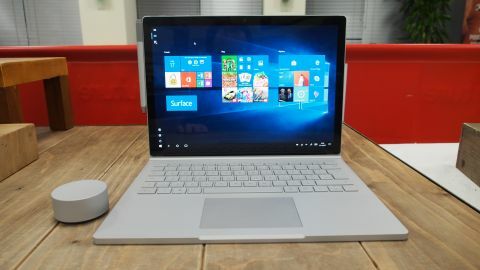 Microsoft has branded the Surface Book 2 the most powerful Surface Book ever, which may not really be saying much seeing as there’s only been two previous Surface Books, but make no mistake, this is a powerful device with top-notch components. Don't think the 13.5-inch Surface Book 2 is just a smaller, less powerful version of the 15-inch model either. This convertible laptop combines a sensible feature set and fanless design with its smaller size, which may be more to your liking. Unlike the Surface Book 2 15-inch, the 13.5-inch Surface Book 2 is only available to buy right now in the UK and Australia, rather than just the US. If you’re outside of the US, you’ll have to wait until next year to get the Surface Book 2 15-inch model, so for many people the 13.5-inch model will be your only choice right now. The good news is that Microsoft is offering the Surface Book 2 13.5-inch in a variety of configurations, though like the 15-inch model, they all come with a high price tag. Still, the 13.5-inch models are cheaper than the larger 15-inch models. So, in the US the base specifications of the Surface Book 2 13.5-inch model gets you a 7th Generation Intel Core i5 CPU, 8GB RAM, 256GB and integrated GPU for $1,499. Meanwhile, the lowest spec model available in the UK costs £1,499 (around AU$2,600). All territories then get the same specifications, with an 8th Gen Intel Core i7 CPU, 8GB, 256GB, and GTX 1050 GPU with 2GB GDDR5 memory for $1,999 or £1,999 (around AU$3,400). Meanwhile, the 8th Gen Intel Core i7, 16GB RAM, 512GB SSD and GTX 1050 GPU config goes for $2,499 or £2,499 (around AU$4,300). Finally, the top configuration, which is the one we received for review, comes with an 8th Gen Intel Core i7 CPU, 16GB RAM, 1TB SSD and GTX 1050 for $2,999 or £2,999 (around AU$5,200). So, this a definitely an expensive proposition, even with the basic specs, which will make most people take pause, but it’s not quite as eye watering as the price of the top spec of the 15-inch model, which comes in at $3,299 (around £2,503, AU$4,341). Meanwhile, Apple’s 15-inch MacBook Pro with Touch Bar starts at $2,399 (£2,349, AU$3,499) and comes with a 7th-generation Intel Core i7 processor an AMD Radeon Pro 555 graphics with 2GB of VRAM, 16GB of memory and a 256GB SSD – all powering a 2,880 x 1,800-pixel 15.4-inch display at 220 pixels per inch as well as an OLED Touch Bar. Another alternative is the Dell XPS 13 which currently resides at the top of our best laptops list. It’s a wonderful machine, and while it doesn’t pack the same high performance components as the Surface Book 2 in either size, it also costs a heck of a lot less, starting at $799 (£999, AU$1,899), for a dual-core Intel Core i3 CPU, 8GB of RAM and 128GB of SSD storage paired with a full HD, 1,920 x 1,080 InfinityEdge screen. Meanwhile, the top end model comes with a Core i7 CPU, 3,200 x 1,800 InfinityEdge touch display and 8GB of RAM for around half the asking price of the top end Surface Book 2 13.5-inch model. Pricing the Surface Book 2 13.5-inch so high reflects Microsoft’s ambitions to sell it as a luxury device, but its competitors are offering alternatives that are just as desirable, and can cost a lot less, Microsoft has to prove that the Surface Book 2 13.5-inch is worth the hefty price tag. We noted in our review of the 15-inch version of the Surface Book 2 that the design had barely changed from the original Surface Book, except the device was larger to accommodate the 15-inch screen. With the 13.5-inch Surface Book 2 having the same size screen as the original, it means the difference in the designs is even less obvious. At 312mm x 232mm x 13mm (12.3-inch x 9.14-inch x 0.51-inch), it’s thinner than its predecessor, which measured 14.13 x 9.73 x 0.71 inches or 359 x 247 x 18mm, and it weighs 164.2kg (3.62 pounds), compared to the original’s 2.04kg (4.49 pounds). So, Microsoft has made a more powerful version that’s thinner and lighter, which is always good. Another big difference between the design of the 13.5-inch Surface Book 2 and the 15-inch version, is that the 13.5-inch has a fanless design. This is a rather nice result of the 13.5-inch model having less powerful (and therefore less power-hungry) components. The more power a component needs, the hotter it gets. By not having any fans, the 13.5-inch Surface Book 2 can be smaller and lighter, whilst also running practically silently. As with the other models, the screen of the Surface Book 2 detaches with a satisfying click, and Microsoft told us that the process of changing from laptop mode to tablet mode has been improved, making for a quick and easy process. In the hand the Surface Book 2 in tablet mode feels fantastic, and is one of the lightest and thinnest Windows 10 tablets we’ve tried. When in this mode, the Surface Book 2 loses the additional graphics power and battery life. The process of detaching the screen is very easy, you just tap the detach button on the keyboard, then simply remove the screen. Windows 10 responds by turning into 'Tablet' mode, which brings back the Start Screen from Windows 8, with large icons that are easy to tap on. While the Start Screen isn’t much loved on Windows 8, here it works well, making Windows 10 easy to use in the tablet form factor – and it remains quick and responsive. Another nice touch is that if you’re using a demanding program or app that requires dedicated graphics, you’ll be warned to save your work before detaching the screen. The iconic – and divisive – fulcrum hinge also returns with the Surface Book 2 13.5-inch. While it prevents the device from being as thin as possible when it’s closed (think of the hinge like the spine of a book), it allows you to angle the screen easily without the device tipping over. As for the trackpad and keyboard, both feel comfortable to use, with the back-lit keyboard in particular feeling great to type on thanks to substantial key travel. The trackpad also felt smooth and responsive when used. When turned into a tablet, the Surface Book 2’s 13.5-inch display is clearly the focus, and Microsoft knows this, providing a stunning PixelSense display with a resolution of 3,000 x 2,000, which equates to a 267ppi (pixels per inch) density. The 15-inch model has a higher resolution of 3,240 x 2,160, but this is over a larger area, so it actually has a slightly lower pixel density of 260ppi. Either way, the screen looks fantastic thanks to a 1600:1 contrast ratio that makes colors appears vibrant, while also showing off deep blacks. The 3:2 aspect ratio gives you plenty of vertical space when using Windows 10 and its various apps, and it feels natural when used as a tablet. However, it also means that videos in the common 16:9 aspect ratio have bars above and below the action. Along the sides are two full sized USB 3.1 ports, a USB-C port (which we’re pleased to see), and a full size SD card reader, which is another welcome addition. The headphone jack port is on the top right corner of the screen, which is an odd place to put it when in laptop mode, as it means the headphone wire may get in your way when working, but it makes a bit more sense when the Surface Book 2 is used as a tablet. Charging is done via a proprietary ‘Surface Connect’ port, and the charger magnetically attaches itself when inserted, which is quite satisfying in a MagSafe-less world. Overall, the Surface Book 2 13.5-inch is undoubtedly a premium product – nothing about it feels cheap. As you’d expect from a Surface device, the Surface Book 2 works very well with Microsoft’s Surface Pen and Surface Dial. We had a quick go on both, and will spend a longer time with each one in the next few days, so check back for an expanded review. However, even with our limited time with the Surface Pen and Surface Dial, we could see that them as natural companions for the Surface Book 2, with the Surface Pen in particular being an excellent companion, responding smoothly and quickly to our scribbles and notes. It’s such a nice experience that we can’t help but feel that Microsoft has missed a trick by not including a Surface Pen with the Surface Book 2. Instead, you’ll have to pay $99 (£99, AU$139) for the stylus. Considering the high price of the Surface Book 2, it can feel a little cheeky that you’re asked to shell out some extra cash for the full experience. The Surface Dial, a puck-like disc that can change context-sensitive settings by turning it like a… well... a dial, be it volume, brush size and more, feels less essential, but again works brilliantly with the Surface Book 2. Watching a video, we placed the Dial on the Surface Book 2’s screen and used it to change the volume. It all works very well, and the context-sensitive controls popped up on the screen around the Dial. Of course, using it on the screen does obscure a bit of the display, but the digital-analog wheel works when it's just sitting on your desk.